Feren OS is a free Replacement for Windows and macOS with some of the best that the Linux Community can offer in customisation, applications, and much more in one package. Feren OS is also a one-of-a-kind Distribution for its customisation and familiarity, as well as being one of very few Rolling Release* Distributions that takes the Stable Path over Bleeding Edge, and it is designed to be faster, more powerful, and more secure. *It's more of a pseudo-rolling-release for now, but my future plans are to make it full-scale Rolling, but NOT cutting-edge. What's new in Feren OS? Improved theming, a new OOBE Screen, major Welcome Screen improvements, a completely new installation experience and a new OEM Setup experience for 64-Bit Feren OS, package and repository improvements, massive under-the-hood improvements, refinements across the whole of Feren OS and a ton more new changes with April 2019 Snapshot. An Operating System Designed with Love by people like you①. With Feren OS, you can enjoy a customised Cinnamon Desktop that is designed with love and care for users, and is designed to work with multiple workflows and be versatile and familiar to the user. Plus, with the customisation options available for Feren OS's Cinnamon Desktop, anyone can customise Feren OS to work their way. Feren OS is a British-made Linux Distribution that is based on Ubuntu, one of the most popular Linux Distributions out there, being well regarded for its rock solid stability, which means you'll be able to do more tasks without much of the fuss②. This OS is built on the same stable Open Source base and Software that powers every system from the International Space Station to the US Department of Defence. Say goodbye to waiting for updates to install to do your daily work, and say goodbye to being forced into sending your data to others③. Feren OS installs updates automatically④ while you work, meaning you are never interrupted when you are doing your day to day tasks⑤. With these continuous updates, Feren OS receives continuous security fixes and patches which helps the OS tackle day to day threats⑥. In a world of growing technology, you want to just be able to be ready and set up with your favourite internet browser, and other programs, too, with everything configured just the way you like it, so that you can keep with your workflow. 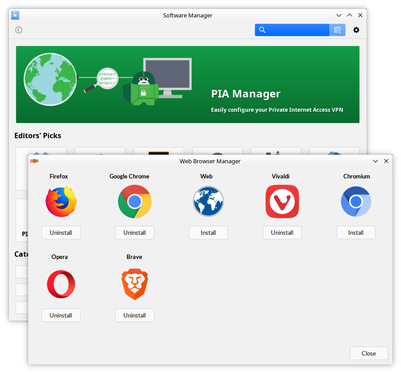 That's why Feren OS offers two easy to use programs for finding and installing your favourite software: Web Browser Manager for installing your favourite web browser, and Software Manager for installing any other applications you may like. Plus, there's no needless fuss, little to no needless prompts, and definitely little to no interruptions both when installing the applications, and also when setting your default applications. With unparalleled customisation compared to most rivalling major Operating Systems, Feren OS lets you customise your heart out with plenty of ways to make Feren OS your own out-of-the-box, from Themes to Theme Colouriser. With Feren OS, you have so much freedom and customisation, that no two desktops will ever be the same. Feren OS works with a majority of the devices Windows and macOS works with and as well as that, switching to feren OS is a breeze. With Feren OS, most of your documents, music, videos, pictures, etc all work out-of-the-box. You can even run most of your favourite applications with Wine⑦. Feren OS gives you the flexibility to run more than just Feren OS on the machine you use, for example, you could dual-boot Feren OS with Windows. You can then choose the OS you want to boot into at startup. Feren OS's base, Linux Mint, has many language options that work out-of-the-box in Feren OS, though, not everything is translated yet, if you want to help, contact us. Feren OS also comes with assistive technologies, so anyone can use Feren OS easily. "Feren OS is a great looking distro that's ideal for people switching from Windows to Linux." "Imagine taking Linux Mint, placing the Cinnamon desktop on it and then theming it to not only to serve as a perfect drop-in replacement for Windows 7 but to be one of the most beautiful Linux desktops you’ve seen in a long while. That’s what Feren OS has managed -- and has done so with aplomb." "​Feren OS is a polished and well-stocked Linux distro that comes close to being an ideal replacement for Microsoft Windows and macOS. In fact, this impressive Linux OS is a very attractive replacement for any Linux distro." So, convinced, ready to give Feren OS a try? Feren OS is available to download and install today for free, if you try it out and like it, go ahead and install it, you'll find a good community out there in the internet able to help with any problems, requests, and so on, and if you have anything to say, just let us know! I hope you download and enjoy Feren OS as much as I did making it! Enjoy taking back control of your computer! TIP: Some issues you may have with Feren OS may already be solved in the upstream communities, be sure to search your problem on your favourite search engine with the term "Ubuntu" or "Linux Mint" added on somewhere to it before trying to get help from the Feren OS Community, but please don't ask questions about Feren OS on websites such as Ask Ubuntu and the Linux Mint Forums, they probably won't appreciate it, especially not Ask Ubuntu. ① The design of feren OS is done by the community and you can help with Feren OS's design too. ② Performance and Stability may vary depending on hardware. While Feren OS works beautifully well on a lot of machines, some machines could have certain issues running the OS, and/or may not run the OS in the intended way due to certain unsupported drivers. ​A rule of thumb is to check how well the OS performs (might have reduced performance due to running off external storage) when running from a Live USB, CD or DVD before proceeding to install the OS. ③ Comparison applies to Operating Systems only when just installed, and before launching any applications whatsoever. Feren OS will always tell you upfront if any data collection is being done by our intention, and will give you an option to prevent it. ④ Requires an Internet Connection. ⑤ Excludes Major Updates. These are special updates that appear only once every two years, and bring with them a huge load of updates. ⑥ Just be sure to get an antivirus for that extra layer of security, and make sure it's one for Linux, because of as Linux gets more popular, it'll become more of a popular target for attackers, though, for now at least, these attacks are still reasonably rare compared to attacks at leading Operating Systems. ⑦ WINE and PlayOnLinux need installing first, this can be done from the Welcome To Feren OS Dialog, the Welcome Screen, and even from apt://wine-duo-feren (you must use Feren OS for the link to work).